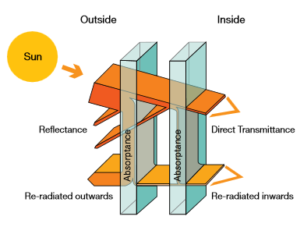 The solar control film, easily applicable on window glasses, has the property of reflecting part of the solar radiation received, decreasing the amount of energy that passes through the glass. Films add security, slowing down a break in and holding shards together if the window shatters. Low investment. The approximate cost of low emissivity layers is 20 €/m2, although it varies for each type of layer. Savings of 1 to 14 €/m2 are expected. Window films can cut utility costs by 30% to 40%. It is much cheaper than replacing windows.